Commissioner Margrethe Vestager, in charge of competition policy, said: "Capacity mechanisms can help to safeguard security of electricity supply, but they must be designed so as to avoid distortions of competition in energy markets. I am glad that our close cooperation with national authorities has enabled us to today approve well-designed capacity mechanisms in six EU countries. They will foster competition among all potential capacity providers to the benefit of consumers and our European energy market." The six capacity mechanisms approved concern more than half of the EU population. They cover a range of different types of mechanism that address the specific need in each Member State, namely strategic reserves, market-wide mechanisms and measures specifically promoting demand response. In the cases of Belgium and Germany, the Commission has authorised strategic reserves. Strategic reserves keep certain generation capacities outside the electricity market for operation only in emergencies. They can be necessary to ensure security of electricity supply when electricity markets are undergoing transitions and reforms and are meant to insure against the risk of a severe supply crisis during such transitions. Both Belgium and Germany have clearly identified and quantified the security of supply risks to be addressed by the reserves. For Belgium, the reserve is needed to mitigate the supply risks due to Belgium's high reliance on an ageing nuclear fleet, including when it comes to imported electricity. For Germany, the reserve is needed to ensure security of supply during the ongoing reform of the German electricity market and to manage the phase-out of nuclear electricity generation. Both reserves are temporary and will be removed when the underlying market issue is solved. Finally, the strategic reserves are procured through regular, competitive tenders open to all types of capacity providers,including demand response, to ensure effective competition and to limit costs. On this basis, the Commission concluded that both measures are in line with EU State aid rules. 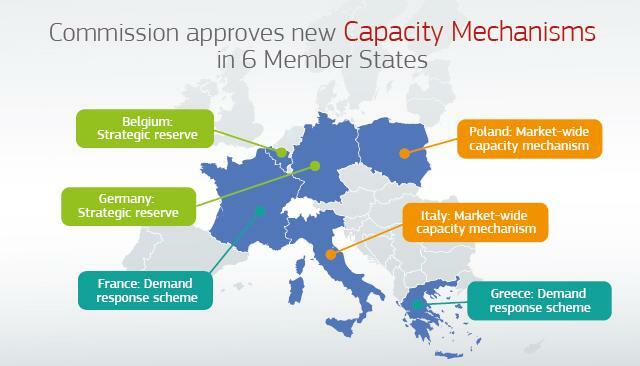 In the cases of Italy and Poland, the Commission has authorised market-wide capacity mechanisms. These can be necessary where electricity markets face structural security of supply problems. Under a market-wide capacity mechanism, capacity providers can obtain a payment for being available to generate electricity or, in the case of demand response operators, for being available to reduce their electricity consumption. Both Italy and Poland have clearly identified and quantified the security of supply risks, alsotaking into account possible imports from neighbouring countries. Italy has demonstrated that a significant amount of capacity risks exiting the market and new investments are unlikely to take place because investors cannot earn a sufficient return from their electricity sales. Similarly, Poland has demonstrated that it is faced with market failures in the electricity market that prevent prices from incentivising power generators to keep existing capacity in the market or to invest in new capacity. Both mechanisms in Italy and Poland are open to all types of capacity providers, including demand response, existing and new capacities, domestic and foreign. Furthermore, the measures will keep costs for consumers in check thanks to the regular, competitive auctions to allocate capacity contracts. In parallel, both Italy and Poland committed to implementing reforms to the functioning of the electricity markets. On this basis, the Commission has found both measures comply with EU State aid rules. This follows the Commission approval of market-wide capacity mechanisms in Great Britain, France and for the Irish 'all-island' market on the basis of the same criteria. In the cases of France and Greece, the Commission has authorised capacity mechanisms specifically promoting demand response. Demand response schemes pay customers to reduce their electricity consumption in hours when electricity is scarce. The advantage of such schemes is that demand response operators may be able to react more quickly than electricity generators. Moreover, it is generally more environmentally friendly to reduce consumption than to produce additional electricity, and these schemes can render the construction of additional power plants unnecessary. France has demonstrated that this scheme is necessary to further boost the demand response sector in the country, where extreme demand peaks during cold weather are likely to occur. In the case of Greece, the existing scheme played an important role in managing the tight electricity situation during cold spells in December 2016 and January 2017 and the measure may be called upon again in the near future. Both measures are temporary and support will be granted through regular, competitive tenders to keep down costs. On this basis, the Commission has found they comply with EU State aid rules. This follows the Commission's approval of a specific demand response support scheme in Germany in 2016 on the basis of the same criteria. On the event of the celebration of Ignalina NPP federation's 25th anniversary, Thomas Schneider, President of FECER european energy sectoral federation of managers, has sent a warm letter of congratulations and support to the President Dranik, the delegates and members of the Independent Trade Union of SE Ignalina NPP. In this letter he recalls the conditions in which Ignalia NPP federation was created and its commitments with the managers and with the employees of the power plant. Please read the attached letter ! After the attacks in Nice. When terror hits so brutally and in such a cowardly way like it did last night in Nice, one cannot remain but speechless. Words of sorrow and condolences for those who have been hit by the tragedy, words of condemnation for this attack, words of support for our peoples who need to find solace and serenity in these very troubled moments are what is needed. But finding the right ones to do so is not an easy task. We stay close to the people of France, to our French colleagues, and to all those who, in one way or another, have been touched by the attack in Nice. The CEC organisations are launching the communication campaign « managersforEU » on social media. The campaign that has been presented during the Executive Board, on Monday 13th of March 2017.It aims at displaying managers commitment to the European Union. All CEC affiliates are pleased to launch this first social media campaign and count on our common commitment to promote CEC role and influence within European union stakeholders. In July 2015, FECER and CEC signed a letter of support to CFE-CGC Energies, combined with a master network engineering, engaged in their European project "Reinventing industrial relations in Europe with and for Youth : A research applied to energy transition ", developed as part of a call for proposals from the European Commission. The project aims to raise awareness and increase interest in the issues of social dialogue for students of European universities.